Take Fulton Drive to Brunnerdale N.W. Turn North. Brunnerdale becomes West Blvd., then Lake O’ Springs Avenue. Continue North past Island Drive until you see the lake on your right at the top of the hill. Turn right (East) onto Westlake Boulevard N.W., Go to stop sign. To go to the office or tour around the lake either way. See directions below. Exit onto Portage Rd. Go west on Portage 1.5 miles. At light, turn south on Lake O’ Springs Avenue. Go 1/4 mile and turn left (east) onto Westlake Boulevard N.W. Go right on Swan Lake Circle or Springlake Road at the stop sign. To go to the office of Ohio Vedic Homes, turn left onto Springlake Road. Office is in the 1846 log home at 5858 Springlake Road N.W. Manager: David A. Kidd. Call for an appointment at 330-417-3888. 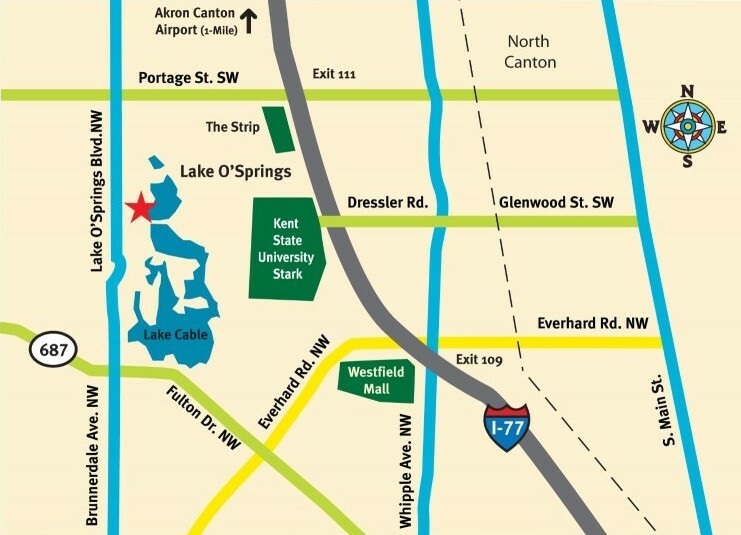 To TOUR AROUND LAKE O’ SPRINGS turn left or North on Springlake Road. It circles around the North end of the lake, goes East, then South. Turn right on Woodhaven which dead-ends at the Eastern shore next to a gas storage well. After returning to the office, you can continue South on Springlake into the new 12-acre development area on the SW side of the lake.